CALIFORNIA 46 • SHOPPING CENTER BUSINESS • September 2018 for the mixed-use play. Malls are be- ing expanded to include residential components. With the added trend of office tenants moving in, it lends to neat micro-ecosystems in certain mar- kets that could have great potential to rekindle the community vibe malls once had." Savvy retail landlords aren't just sitting on vacancies left by Toys "R" Us, JC Penney, Sears and Macy's. Instead, they're getting creative and repurposing these spaces. 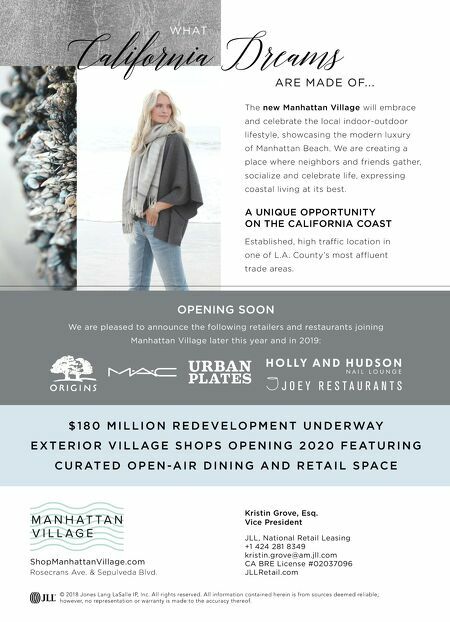 Macerich recently announced a partnership with co-working startup Industrious to backfill its retail spaces, while GGP and Unibail-Rodamco-Westfield have already utilized this strategy to diver- sify their offerings. "Other retail REITs like CBL Prop- erties are talking with co-working operators as well, and we are seeing many big-box spaces being convert- ed into conventional offices or call centers, if not co-working spaces," Thompson continues. "It's not unre- alistic to envision a mall with WeWork spaces or large corporate offices that also include dynamic daycare or chil- dren's museums in conjunction with a grocery anchor. Owners can also maintain the inline tenants and restau- rants to fill the lunch meeting needs for business and after-work errands for families all in one location." BE EFFICIENT Retail owners like to run a tight ship, which can be difficult to do in a state with a shopping demographic that values excess. This task becomes ever harder when some of the "ex- cess" these shoppers value includes free-use public spaces and compli- mentary programming. So, the smart ones are looking for other ways to trim the fat. This starts with parking. "The evolving nature of transpor- tation in California opens many chal- lenges and opportunities," Perkowitz says. "With rideshare and public tran- sit, do we need as many parking spac- es at every shopping center? And, if not, what do we do with that surplus space?" 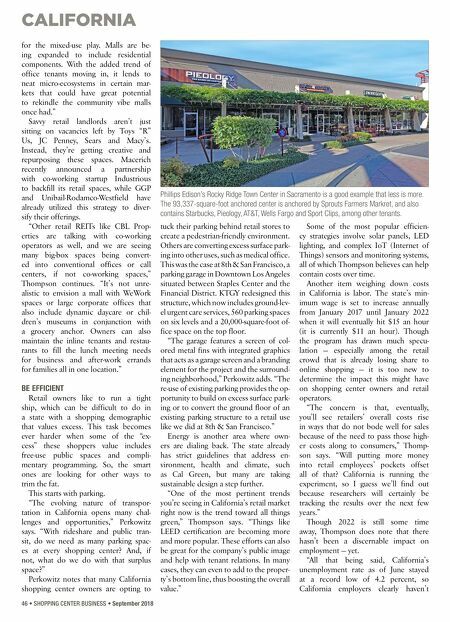 Perkowitz notes that many California shopping center owners are opting to tuck their parking behind retail stores to create a pedestrian-friendly environment. Others are converting excess surface park- ing into other uses, such as medical office. This was the case at 8th & San Francisco, a parking garage in Downtown Los Angeles situated between Staples Center and the Financial District. KTGY redesigned this structure, which now includes ground-lev- el urgent care services, 560 parking spaces on six levels and a 20,000-square-foot of- fice space on the top floor. "The garage features a screen of col- ored metal fins with integrated graphics that acts as a garage screen and a branding element for the project and the surround- ing neighborhood," Perkowitz adds. "The re-use of existing parking provides the op- portunity to build on excess surface park- ing or to convert the ground floor of an existing parking structure to a retail use like we did at 8th & San Francisco." Energy is another area where own- ers are dialing back. The state already has strict guidelines that address en- vironment, health and climate, such as Cal Green, but many are taking sustainable design a step further. "One of the most pertinent trends you're seeing in California's retail market right now is the trend toward all things green," Thompson says. "Things like LEED certification are becoming more and more popular. These efforts can also be great for the company's public image and help with tenant relations. In many cases, they can even to add to the proper- ty's bottom line, thus boosting the overall value." Some of the most popular efficien- cy strategies involve solar panels, LED lighting, and complex IoT (Internet of Things) sensors and monitoring systems, all of which Thompson believes can help contain costs over time. Another item weighing down costs in California is labor. The state's min- imum wage is set to increase annually from January 2017 until January 2022 when it will eventually hit $15 an hour (it is currently $11 an hour). Though the program has drawn much specu- lation — especially among the retail crowd that is already losing share to online shopping — it is too new to determine the impact this might have on shopping center owners and retail operators. "The concern is that, eventually, you'll see retailers' overall costs rise in ways that do not bode well for sales because of the need to pass those high- er costs along to consumers," Thomp- son says. "Will putting more money into retail employees' pockets offset all of that? California is running the experiment, so I guess we'll find out because researchers will certainly be tracking the results over the next few years." Though 2022 is still some time away, Thompson does note that there hasn't been a discernable impact on employment — yet. "All that being said, California's unemployment rate as of June stayed at a record low of 4.2 percent, so California employers clearly haven't Phillips Edison's Rocky Ridge Town Center in Sacramento is a good example that less is more. The 93,337-square-foot anchored center is anchored by Sprouts Farmers Markret, and also contains Starbucks, Pieology, AT&T, Wells Fargo and Sport Clips, among other tenants.